Da Vinci lived a life of celebrity, and yet many of his greatest ideas and creations were too radical even for the adoring eyes of Renaissance Europe. He hid them from the world as best he could, but of course he could never hide them from the Grand Detectives Society. 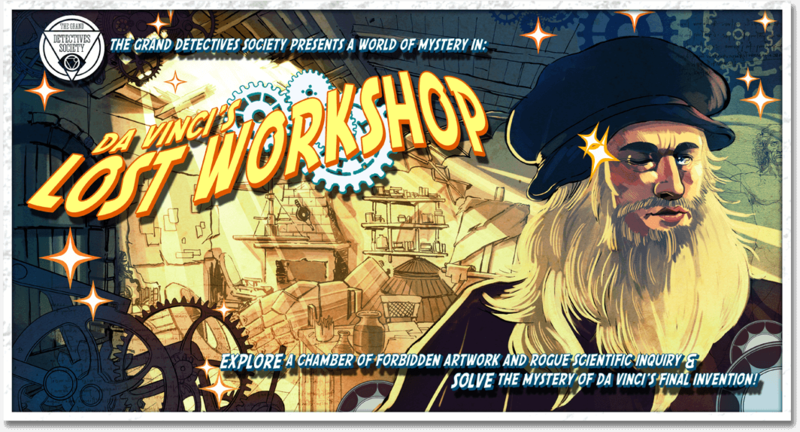 In our stunning recreation of the Lost Workshop, your official Society task is to discover the nature of his final invention, including its operation and purpose. The only thing standing in your way is Da Vinci himself, with a litany of ingenious puzzles, unstable machinery, and violent security measures in place to permanently safeguard his secrets. EXPLORE this chamber of forbidden artwork and rogue scientific inquiry, filled with never before seen masterpieces and creations. DECIPHER the trail of cryptic charts, blueprints, and encoded journal entries containing Leonardo’s most enigmatic thoughts and discoveries. SOLVE the mystery of Da Vinci’s final invention, and the obsession that would claim his life. ESCAPE while you can. The tricks and traps of the Renaissance master will extinguish any unworthy intellect that dares venture into the Lost Workshop!